As anyone who has experienced a chronic pain condition knows, pain doesn't just impact on our physical body, but can also affect our mood, motivation and overall wellbeing. Statistics show that people with long-term health conditions are two to three times more likely to experience mental health problems than the general population - most commonly anxiety or depression. It can really become a vicious circle: when our mood is low, it's harder to cope with our pain, and when it's harder to cope with pain, our mood suffers. Many conditions may flare up or deteriorate when our mood is low and so we feel even worse. Sleep is also a real issue. When we are in pain, we often don't sleep very well, and lack of sleep can be linked to low mood and make it harder to cope with everyday tasks. Of course, living with pain isn't ever going to be fun but we don't have to let it stop us from enjoying life. The trouble is no one teaches us how to cope with pain, challenges and long-term illness. Manchester Mind runs a special course for people with long-term conditions designed to help people manage their stress and build emotional resilience – and in doing so, lift their confidence, mood and emotional wellbeing. Over six sessions, people who come on the course learn different ways of handling low mood, persistent worries and negative thoughts, and learn what to do to manage their stress, including trying different relaxation techniques. While we can't magic the pain away, giving people coping techniques can make a very real difference to their every-day lives. Being in a group and learning together is also really important. After all, people could have learned the skills we taught from a book, but learning and supporting each other is a big part of what makes the course work so well. If you can't come on a course – what can you do to help lift your mood, and help you to better cope with your pain? Relaxation exercises and meditation are key elements to our course, and something that you can easily try at home. When we're in pain, relaxation can seem daunting, but we all have the capacity to relax, it just might take a bit of practice to get there. 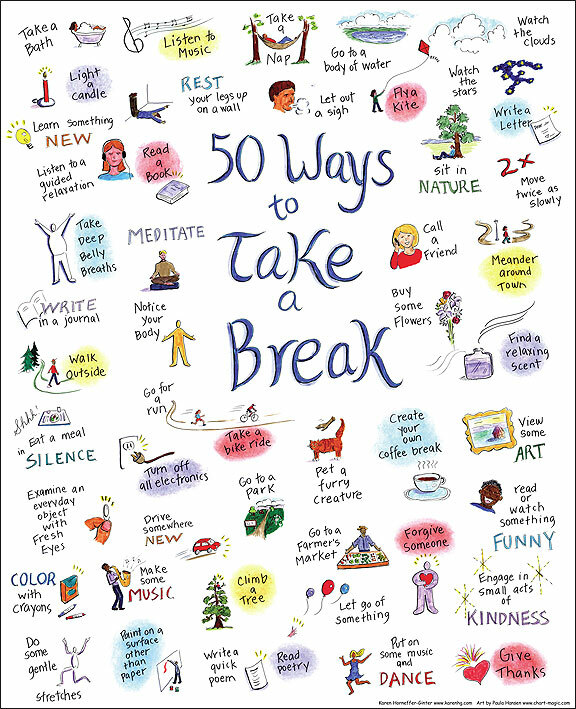 If we've got busy lives it can feel like there isn't enough time to spend on taking a break, but the busier we are, the more important it is to take some time to look after ourselves. We're not just doing ourselves a favour, and our friends and families will benefit too if we're feeling more relaxed and happier. There are lots of different relaxation techniques to try out – and many are freely available on the internet. You could try a visualisation which will help to transport you to a beautiful and relaxing place, or a progressive muscle relaxation routine, which will teach you to tense and release your muscles in turn, until your whole body feels more relaxed. One of the most important tools to help with pain and stress is free and available to everyone – and that's our breath. In the first session of our course, we teach people how to belly breathe. When we're stressed, in pain and anxious, we can often be breathing quite shallow breaths and not even notice it. Belly breathing is an opportunity to take some conscious control over our breaths, direct it into our bellies and trigger the body's natural calming hormones. - Make that sure you are in a comfortable seat and place your feet flat on the floor. - Place your hands gently on your stomach and breathe naturally to start with. - Gradually start to see if you can notice any movement beneath your hands. You might notice your stomach expanding slightly as you breathe in, though it might take a while before you notice anything. - As you keep breathing, see if you can imagine the breath drawing down into your stomach and then leaving your stomach as you breathe out. - With each out breath from your belly, see if you can notice any changes in the body. You might notice your arms and legs feeling more relaxed, the tightness in your chest easing, or a feel of calm. It might take a while before you start to notice any changes in your body, and you might not notice anything at all at first, but that's okay and perfectly normal when trying something new for the first time. Breathing in and out a little more deeply through the nose can help you to relax a bit more, as can making the out-breath slightly longer than the in-breath. - Practice this several times a day and have a go at using the technique to help you when you feel stressed, anxious or if your pain is a little overwhelming or intense. Ruth Rosselson, a Resilience Coordinator at Manchester Mind. Manchester Mind is still running Building a Healthy Future courses (in Manchester only) which are free to attend – click here for more information or contact bahf@manchestermind.org for details. For details of courses being run by your local Mind click here.